While there are many different ways to remove a stump from your yard, stump grinding is often the fastest method. We use specialized equipment to grind down the stump and the tree roots. How does a stump grinder actually work? It has a metal wheel with sharp, cutting teeth bolted to the wheel. Our crew will grind down the stump by using the teeth. The wheel goes back and forth over the stump, making it smaller with every pass. Voila! The stump is eventually ground down into chips. In the past, people assumed that if a stump wasn’t obstructing anything else in the yard or was in a remote location, it could be left alone. 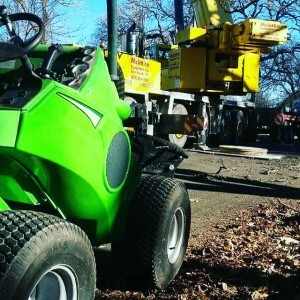 While that’s still sometimes the case, new research has shown that grinding stumps can reduce the chances of your yard being infected with tree fungi. Stumps can also get infected with wood decay fungi. These fungi will eventually develop spores, and they’ll seep into the soil. If a healthy tree becomes wounded, this fungi in the soil could infect the wound in the tree. How deep does a stump have to be ground down? That depends on what the area will be used for in the future. If it’s going to be replanted with grass, then we’ll grind the stump to a depth of about 4 to 6 inches. That will be sufficient for the grass to grow. But if another tree will be planted in that spot, we can grind a much deeper and wider hole so that the new one’s root ball will have room. 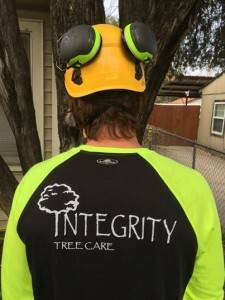 If you’re needing help with stump grinding in Fort Worth or the surrounding area, Integrity Tree Care is the name to remember! Contact us today for help. Before we start any stump-grinding job, we’ll need to know if there are any possible obstructions in the area, including sprinkler lines, electric wiring for accent lights, underground dog fences, etc. Some heavy-duty grinders can finish the job within several seconds. After the stump is cut down into wood chips, the chips will be removed and replaced with topsoil. 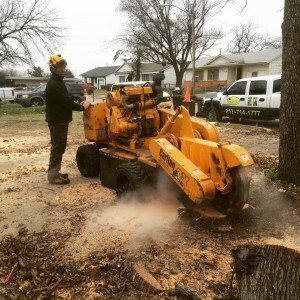 If you’d like more information about stump grinding in Fort Worth or the surrounding area, contact our team of friendly professionals today. We’re here to help!